Life in Los Angeles as Melody Maker’s correspondent there during the second half of 1973 was full of surprises, some of them slightly surreal. On October 21 I interviewed Peter Wolf, the singer with the J Geils Band, in his suite at the Continental Hyatt House on Sunset Strip, or the Riot House as it was renamed after Led Zep trashed it. Wolf’s girlfriend at the time, the easy-on-the-eye actress Faye Dunaway, sat in on the interview and, when it was over, asked me about England, about the royal family, about our customs and why our policemen don’t carry guns. She was quite tiny, birdlike almost, and very beautiful, and she spoke to me in a word-perfect English accent that I congratulated her on. I think she was showing off for me, and I appreciated it. That night the JGB played at Long Beach Arena and strangely enough the opening act was my friends Slade who had a hard time energising an audience clearly interested only in the headliner. I watched the JGB from the side of the stage, as did Faye, not far from where I was stood, and although we acknowledged one another we didn’t speak, probably because of the din. Afterwards there was a reception for the JGB aboard the ocean liner the Queen Mary, which had been remodelled as a hotel and was permanently docked nearby, and when I got to the room where the party was being held I saw Faye sitting alone at a table. She was wearing a slinky, clingy cream-coloured dress, and high heels, and looked even more outrageously lovely than she had in the afternoon, so I asked her if I could get her a drink. I brought her a glass of champagne I think, and we continued our conversation about English customs. To my surprise and delight, after a few minutes and no sign of Peter Wolf she suggested we take a stroll along the decks, so we stepped outside together, me feeling like that the cat that's got the cream. I felt I ought I ought to pinch myself but I wasn't dreaming. This was really happening. "I hope to play myself. I'm partnering Mr Vanderbilt, the millionaire." "Indeed. I hear he plays extraordinary well." It was a hoot. I was thoroughly enjoying this, and I think she was too. We came to a ladder that took us to a higher level and I followed Faye up into a sort of look-out area where we continued our ad-libbing. Then we heard Peter Wolf shouting from below. He sounded peeved, probably thinking something was going on between us (as if!). Faye excused herself and went back down to soothe him. When I finally made it back to the party they had both left. Faye married Peter Wolf the following year but they were divorced in 1979. I never saw either of them again. Back in 1968 in Skipton I was part of a failed experiment to turn a bar called Andertons run by a pal of mine called Pete Thwaite into a disco three nights a week. I was, of course, the DJ, and I wore a white jacket with dark pin stripes which I thought made me look the part. I hauled my collection of singles down there and sat behind one turntable doing the best I could for the few who showed up. I played singles by The Beatles, Stones and Who and anything else I had to hand but the best ones, the ones that got the ‘crowd’ of less than ten dancing, were those on the pale blue Stax label with a logo that featured a small pile of singles looking like they were about to topple over: ‘Knock On Wood’ by Eddie Floyd, ‘Green Onions’ by Booker T and The MGs and ‘Hold On, I’m Coming’ by Sam & Dave. 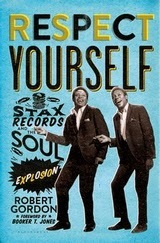 I couldn’t help but recall those days as I read Respect Yourself: Stax Records & the Soul Explosion (Bloomsbury), by Robert Gordon, a superb history of the label published earlier this year which I finished the other night. In many ways the book is a tragedy of Shakespearian proportions, the story of how a good-hearted white brother and sister team created something quite magnificent in racially divided Sixties Memphis, only to see it flounder hopelessly through bad luck, bad timing and not reading the small print in contracts. And there’s much more to the story than just the wonderful soul and R&B music that Stax brought to the world: the building they worked in, the studio, shop and offices, became an oasis where black and white musicians could fraternise, create, hang out and generally behave towards each other civilly, as people should, while all around them outside of this building Jim Crow laws and attitudes separated the races and created misery on both sides of the racial divide. To take the most obvious example, Booker T & the MGs, the legendary Stax house band, was multi-racial, with a white guitarist (the superb Steve Cropper) and bass player (Duck Dunn), and black keyboard player (Hammond wizard Booker T) and drummer (Al Jackson, probably the best time-keeper ever), a line-up that played havoc with social distinctions below the Mason-Dixon line. All of which makes Respect Yourself an important social document as well as a terrific read about some terrific music. What transpired was that Epstein visited Memphis in March of 1966 to lay the groundwork for The Beatles to visit Stax to record there, probably songs written or about to be written for Revolver, and by inference this probably means ‘Got To Get You Into My Life’ and ‘Good Day Sunshine’. They were especially keen to use the horn players from the Bar Kays, the session group that played on records by Otis Redding, Sam & Dave and all the rest. Epstein stayed at the Rivermont Hotel and Estelle Axton, the queen bee of Stax, suggested The Beatles might stay there too though, when he got word of the visit, Elvis offered Graceland. “Estelle’s son-in-law worked for the Memphis police and his responsibilities included traffic detail, so she assured Epstein that that The Beatles would have no trouble moving through town,” says horn player Johnny Keyes. And then the news got out and chaos intervened. The Memphis newspaper even carried a headline BEATLES TO RECORD HERE. “She [Estelle] confirms an album and a single are planned,” said the newspaper. The Stax studio was promptly inundated by Beatles fans wanting to know when they were due to arrive. “Once fans had official confirmation of where to be on what day, The Beatles had to cancel,” writes Gordon. So Revolver, like all the other Beatles albums, was recorded at Abbey Road and not in Memphis after all. This is adapted from two posts I did last year on Facebook about the live version of Tommy included in the Super Deluxe Tommy package released in November 2013, and now included on Just Backdated in my ongoing endeavours to get all my writings about The Who in one place. 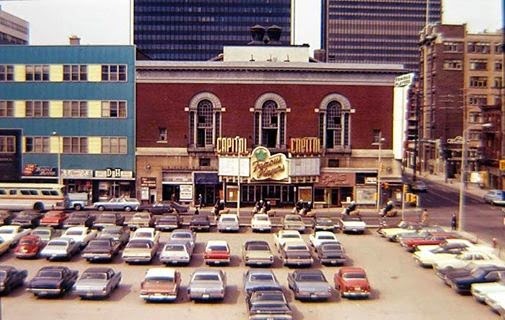 The picture below is the Capital Theatre in Ottawa, as it was in 1969 when the concert in question took place. It was sent to me by Dennis Morgan, from Ottawa, another Who fanatic, and I really love the cars parked outside. [The CD]… opens with a preamble from Townshend about Mose Allison, the composer of ‘Young Man Blues’ in which he explains that Allison called it simply ‘Blues’. (Allison’s version is piano led, of course.) This is followed by a truncated Tommy (‘Overture’, ‘It’s A Boy’, ‘1921’, ‘Amazing Journey’, ‘Sparks’, ‘Pinball Wizard’, ‘Tommy’s Holiday Camp’, ‘We’re Not Gonna Take It’/‘See Me, Feel Me’), then ‘Summertime Blues’ and ‘Shakin’ All Over’ (with ‘Spoonful’ insert). The editing is poor, with beginnings and endings clipped and all spoken introductions lost bar Townshend’s opening preamble, but the playing is phenomenal, perhaps the most impressive versions of ‘Young Man Blues’, ‘Summertime Blues’ and ‘Shakin’ All Over’ on record anywhere, at least to this quality, and that includes Live At Leeds, its unidentical twin Live At Hull, and the well-known, much bootlegged but flawed Amsterdam radio broadcast of September 29, 1969. ‘Sparks’ and the ‘See Me Feel Me’ Tommy climax are also first rate. ‘Young Man Blues’ is the absolute highlight of this concert, possibly the highlight of the whole late autumn North American tour, a staggering seven-minute (two minutes longer than Leeds) version in which Townshend plays a truly breath-taking guitar solo, for my money a guitar work-out that ranks with anything I’ve ever heard him play. Moving from chunks of characteristic rhythmic chord playing into lyrical passages and dextrous finger work high up the fretboard, including untypically delicate jazz-influenced phrases, his guitar just sings its way through the song, a master-class in fluency, invention and intuition. On this, ‘Summertime’ and ‘Shakin’’ all of the 1969 Who simply steamroller along like some gargantuan rhythmic noise machine, playing in a manner that is all but a forgotten art these days. To have been there and witnessed this performance in person, with all the athleticism that The Who brought to their concerts, would have been the consummate rock experience. I believe that in relatively out-of-the-way cities like Ottawa the group felt able to take greater chances than in big US cities where more was expected of them. With less pressure, they were more relaxed and this is reflected in the full-tilt approach to improvisation by Townshend, Entwistle and Moon. Vocally, Daltrey brings an enthusiasm to these songs that reinforces my view that he was always a Fifties rocker at heart, and is actually more comfortable with material from this era which he can sing in a deeper timbre than most of Townshend’s original compositions. It’s all the more remarkable when you consider that for the most part, though, it’s just three musicians up there making all this noise, a drummer, a bassist and a guitarist. I’ve seen quintets with two guitarists and a keyboard that sound thinner than this. The evidence on the CD suggests this recording was made by Who sound engineer Bobby Pridden on one reel-to-reel machine plugged into the soundboard, which explains the bad editing. He would have had to change the reels frequently as they probably lasted only about 20 minutes each (the faster the ips, the better the sound quality but the less time per reel) and in so doing lost bits here and there. This would also explain the missing material – the tapes of the other songs played that night will have been lost or destroyed. Pridden has gone on record as saying that The Who taped scores of shows in 1969 for a possible live album but that Townshend couldn’t face listening to them so he put them all on a huge bonfire in the garden of his Twickenham home and torched the lot. Thankfully, these few tapes from Ottawa escaped the inferno. And this led to me writing a subsequent post, below, after I’d got my hands on the live Tommy in the Super Deluxe package referred to in my opening paragraph above. I was accused of (or praised for) conducting a ‘forensic analysis’ in one of the many comments it inspired, which developed into an interesting debate about the merits of various recorded Who shows. I was (and still am) guessing about tapes being lost or destroyed which, barring ‘Young Man Blues’, would have contained the songs that The Who opened with that night in Ottawa – but I detected something fishy going on towards the end of Tommy. I’ve been listening to the live ‘bootleg’ Tommy from the recent 2013 reissue ‘super deluxe’ package, which was apparently recorded at Ottawa on October 15, 1969, ie the show I referred to in the post here a couple of weeks ago (and now above). For the most part it’s fantastic, the usual marathon performance, all songs segued together so the audience barely have time to catch their breath between them. The usual self-depreciating introduction from Pete is followed by a stunning ‘Overture’, lovely guitar work into ‘It’s A Boy’ and everything you’d expect from The Who at the peak of their game in 1969. The instrumental ‘Sparks’, with its layered dynamics, sudden octave drops and multiple rising crescendos, is heart-stopping, ditto a fierce ‘Pinball’, ‘Go To The Mirror’ with its ‘Listening To You’ insert superbly rendered, and Pete’s seat-of-the-pants jamming at the very end. However, for reasons unexplained, when we get to ‘I’m Free’, it’s obvious to anyone with ears, let alone any knowledge of The Who, that this and some of what follows (‘Tommy’s Holiday Camp’, ‘We’re Not Gonna Take It’ but not the coda of ’See Me Feel Me’ – see below) is from a different concert, in fact Swansea in 1976. As explained by Pete during his introduction, the Ottawa show was recorded simply, with just two strategically positioned mikes. The Swansea show, however, was recorded on Ronnie Lane’s 16-track mobile, so the whole sound from this is different, much fuller. Less obvious but still discernable, especially to those who know their Who, is that the group played differently in 1976 than they did in 1969. Pete was using a Les Paul guitar, which had a sharper tone than the SGs he used on the early Tommy shows, and he improvises more, probably the result of having played Tommy countless times since 1969. Roger’s voice has deepened, improved even, and Keith is more abandoned, using his cymbals more than he did in 1969, perhaps to cover his lack of discipline across the skins. Only John, as ever ill-disposed to change, sounds the same. Strangely, the 1969 show cuts back in (from the 1976 Swansea show) during the intro to ‘See Me, Feel Me’ – you can hear the bad join – but what follows is taken from the reprise of the Tommy segment within the final song of the night, an extended ‘My Generation’ jam, as evidenced by Pete’s guitar improvisation at the end and the fact that he, Roger and John acknowledge the applause from the crowd after it’s all over (proof that the entire concert, as opposed to just the Tommy segment, ended here), neither of which would have happened after a genuine, mid-concert Tommy recital in 1969. So it’s not really a complete 1969 performance of Tommy after all. Now I’m not saying these versions of the Tommy songs from Swansea are below par – on the contrary, like the rest from Ottawa, they’re fabulous – but it just irks me that the group and those that surround them have paid so little attention to detail and continuity, not just underestimating fans’ intelligence but trying to mislead them as well. It might be that the tapes from the end of Tommy at the Ottawa concert were compromised somehow (see above review of Ottawa bootleg, and references to bad edits) so there was no choice but to splice on the recordings from Swansea, but it is especially hard to swallow when the bells and whistles version of Tommy 2013 costs as much as it does. Won’t get fooled again indeed. Here’s what I wrote about Paul Simon’s Graceland, the album that arguably rescued his career, in my guide to his music that was published in 1997. I received some help from my friend Chris Allen who knew more than me about African music. In the summer of 1984, as he faced the problem of furthering a critically successful but commercially waning career, Paul Simon received a gift from his friend Heidi Berg which set him on the road towards what many critics believe to be his masterpiece. The gift was a bootleg tape from the townships of South Africa called Gumboots: Accordion Jive Hits No. 2, and it changed his musical direction radically. Simon spent the rest of the year seeking out similar black African music and, thoroughly inspired by his researches, went to South Africa in February 1985 to spend 17 days recording with local musicians in Johannesburg’s Ovation Studio. Graceland, however, was not recorded solely in South Africa, nor did it consist only of South African music, nor was its subject matter African-oriented. The album was recorded in New York, Los Angeles, London and Louisiana as well as Johannesburg, and included tracks with Cajun and Hispanic backing musicians. While South African mbaqanga and mbube rhythms dominate the music, adding a unique flavour which up to this point was largely unknown in America and Europe, the songs actually fuse South African elements with American pop, thus rendering the unknown more palatable to ears already tuned to Paul Simon. The majority of the tracks were backed by musicians from the townships, and the experience of writing for and in such a different musical tradition was obviously a liberating experience. While the concerns about which Simon chose to write are those of an American writer – and he is too honest a writer to wish or be able to renounce his cultural heritage – his open response to other cultures loosened the bounds of his songwriting and seems to have enabled him to find a new language, both musically and lyrically. The release of Graceland was met with as much political criticism as artistic acclaim. In 1986, South Africa was still ruled by the minority National Party regime, and the essentially peaceful “velvet revolution” (to borrow a description more usually applied to Eastern Europe) which followed from the release of Nelson Mandela, and Prime Minister De Klerk’s recognition that Apartheid was no longer sustainable, was some years away. Sanctions still applied, and a major focus of the anti-Apartheid movement was on high profile sporting and cultural events. Although the principal purpose of the boycott as it affected musicians was to prevent middle-of-the-road or pension-seeking rock dinosaurs cashing in at the notorious white playground of Sun City, Simon had clearly broken the letter of the sanctions regulations. Graceland thus attracted more controversy than Paul Simon, eternally quiet, diligent and uncontroversial, had attracted in his entire career. In vain did Simon plead that, far from offering succour to the oppressor, he had been popularising (and rewarding handsomely) some of the very “victims” the sanctions were intended to benefit. He had wandered into a political minefield. To those who argued that any breach of sanctions was unacceptable – and this position is understandable both in theory and as a propaganda weapon – any counter-argument based on artistic grounds was irrelevant. In the final analysis, however, the artistic merits of Graceland figure more substantially in the history books than the fierce contemporary denunciations that were, in the event, soon overtaken by the accelerating march of progress. The album was a massive commercial success, especially in the UK where, after reaching number one, it lingered in the charts for almost two years. In America, where radio stations are traditionally less attuned to styles of music that don’t comply with their rigid formatting process, Graceland reached number three, though it stayed in the Top 200 for 97 weeks, eventually selling four million copies. The growl of accordion with which the album begins states immediately that this is a different Simon product. With a nod to the Gumboots bootleg which had sparked his first interest in South African music, Simon lets his musical co-writer, the accordionist Forere Motloheloa, signpost the direction the album would take. It is a direction which, in its dense, churning rhythms, owes little or nothing to the blues, to Chuck Berry, or to the American folk and Tin Pan Alley traditions in which Simon had made his reputation. The subject matter – the horrors and insubstantiality which underpins the “days of miracle and wonder” – is less of a radical departure from Simon’s previous work, but he brings a vividness to the lyrics (the juxtaposition of “the bomb in the baby carriage”, for example), as well as a “serious playfulness” (witness the alliteration of “the boy in the bubble and the baby with the baboon heart”), which clearly shows the extent to which this new music had irrigated Simon’s imagination. His lyrics add an ironic counterpoint to the upbeat, cheerful swing of the music, but it is not his purpose merely to moan about the awfulness of life on “a distant constellation that’s dying in a corner of the sky”. He is more knowledgeable, more compassionate and more of a poet than that, and if you doubt the poetic qualities of the song, try achieving in other words the same concise effect as Simon does in the final lines - “these are the days of miracle and wonder, and don’t cry, baby, don’t cry”. ‘The Boy In The Bubble’ was released as a single in the UK, where it reached number 26 with the help of a stunning video which, in 3D, placed Simon in the jungle, surrounded one minute by wild animals and the next by state-of-the-art technology. Joy and sorrow; history and today; America and Africa – in the album’s title track Simon brews a medley of contrasting ingredients into a song as fine as any he has written. The bubbling, insistent, sinuous playing of Baghiti Khumalo on fretless bass and Ray Phiri on guitar provides a perfect counterpoint to the American music which the song celebrates – the Mississippi Delta, home of the blues, memorably defined as “shining like a National guitar”; Elvis Presley, whose Graceland home is the object of the singer’s pilgrimage; and The Everly Brothers, early influences who repay the compliment with their backing vocals on the fade out. But the song is no mere trip down nostalgia lane. Simon’s concerns, and those of the “poorboys and pilgrims with families” who share his journey, are contemporary. The singer is not only divorced (“the child of my first marriage” accompanies him) but also a recent loser in the game of love (the bittersweet phrase “she comes back to tell me she’s gone” tells of a fresh, unhealed wound). Nor is his sympathy reserved for his own misfortunes. His “travelling companions are ghost and empty sockets”; he empathises with the “girl in New York City who calls herself the human trampoline”. The jaunty music, with its traces of rockabilly, might seem callous and insensitive set against the lyrics, with their clear-eyed view of the emotional detritus of modern life, and such a contrast is just the sort of thing Simon excelled at earlier in his career. Simon’s purpose, however, is not to express pity – either for himself or for the other casualties “bouncing into Graceland”. The happy accident of Presley’s choice of name for his famous and magnificent abode allows Simon to play with the religious notion of redemptive grace. Though not previously, nor here, a religious writer, Simon presents music itself as offering a form of salvation. “Maybe I’ve a reason to believe we all will be received in Graceland,” he concludes. This collaboration with General M.D. Shirinda and The Gaza Singers is a lighter piece, contrasting the Shangaan voices of South Africa with febrile chatter of the New York party scene. The song itself stands as a tribute to Simon’s self-confidence in his new work. He can afford to quote the party girl’s putdowns (“She thought I was alright ... in a sort of a limited way for an off-night” and “There’s something about you that really reminds me of money”) as well as his own feeble chat-up line (“Aren’t you the woman who was recently given a Fulbright?”). The repeated line, “Don’t I know you from the cinematographer’s party?”, brilliant in its scansion and rhythm, neatly encapsulates the empty socialising of the New York arts crowd. As the title indicates, this song is another tribute to the accordion-based music that had triggered Simon’s initial interest in the sound of Soweto. Backed this time by the Boyoyo Boys, he tackles a subject perennially popular with poets and songsmiths – love. Among the challenges which this subject presents is the difficulty of finding anything new to say but Simon rises to this challenge. Three vignettes which show different ways of failing to communicate are separated by a chorus which elegantly sums up a feeling every lover has suffered at one time or another. “You don’t feel you could love me but I feel you could”. The song ends with a repeat of the opening two lines, as if to make the point that this is a process that goes around and around forever. This was the first song that Simon heard on his bootleg tape. It is the style of music favoured by mining and railroad workers in SA; ‘Gumboots’ are the heavy boots they wear at work. Unlike the previous songs on the album, which were initially recorded in Johannesburg, ‘Diamonds...’ was recorded entirely at The Hit Factory in New York, when Ladysmith Black Mambazo were in town for an appearance on Saturday Night Live. Curiously, the song opens, unlike the “African” songs, with a verse in Zulu. It also features the popular West African star Youssou N’dour, as well as our old friends Baghiti Khumalo and Ray Phiri. Ladysmith Black Mambazo open the song a cappella, before the familiar bouncing beat kicks in and establishes a cheerful, danceable groove driven headlong by the startling bass guitar of Baghiti Khumalo. The lyrics themselves are somewhat obscure. The rich girl whose non-standard footwear provides the title seems to be involved both with the singer, who takes her for granted, and, doubtless on the rebound, with a poor boy whose “ordinary shoes” can only walk her to a doorway on Upper Broadway. Maybe there are metaphors here, or subtle allusions to New York street life, or a surreal re-working of the ‘Down In The Boondocks’ theme. Maybe Simon is just having fun – “and I could say ‘oo oo oo ...’ as if everybody knows what I’m talking about”. Rumour has it that this song has its origins at a party Simon hosted wherein he met the composer Pierre Boulez for the first time. As he was leaving, Boulez called Simon ‘Al’ and the hostess, his then wife Peggy, ‘Betty’. Whether or not this is true, the song itself has moved a long way from such a simple social misunderstanding. Its theme is an old Simon favourite – alienation. The three verses depict various instances – the man who feels “soft in the middle [though] the rest of my life is so hard”; the man who, having lost his wife, his family, and his role-model, finds “my nights are so long”; the man lost in “a street in a strange world”. Now, though, merely depicting social alienation is not sufficient for the revitalised Simon. As in ‘Graceland’, he offers redemption from such angst. This time it is not music but friendship which provides the means of salvation – “if you’ll be my bodyguard I can be your long lost pal”. A penny whistle solo by Morris Goldberg (a white South African based in New York) offers plaintive support to the music of Baghiti Khumalo and Ray Phiri, underlining the fragility of human relationships which Simon so frequently sees and so sympathetically describes. ‘Al’ was a number four hit in the UK, helped by an unusual, slightly surreal, video whose principal attraction was its stark simplicity in the age of big budget, often pretentious, rock videos. Shot with one stationary camera on one set, it featured Simon’s friend, the actor Chevy Chase, appearing as Simon, playing a Fender bass guitar, while Simon himself appears dressed similarly in the same location, almost as a guest in his own video. If ‘Graceland’ offers the possibility of redemption through music, then the subject of ‘Under African Skies’ is its achievement – “after the dream of falling and calling your name out, these are the roots of rhythm and the roots of rhythm remain”. Set to a lilting ‘walking rhythm’ and backed by Linda Ronstadt’s beautiful descant, which seems to echo to the very skies Simon sings about, the song opens and closes with a pen-portrait of ‘Joseph’ (a name undoubtedly suggested by that of his collaborator Joseph Shabalala but perhaps more accurately to be taken as symbolising an African Everyman). In a few deft lines, Simon sketches both man and continent. Listening to the words and the music together, it is impossible not to sense the vastness of the skies under which Joseph walks. The middle verse, which shifts curiously from Simon’s own, masculine, gender (“my nursery door”) to the feminine halfway through, contains his clearest statement of the redemptive power of music – “give her the wings to fly through harmony and she won’t bother you no more”. Co-written with Joseph Shabalala, the leader of Ladysmith Black Mambazo, ‘Homeless’ is unlike any of the other songs on the album. Sung entirely a cappella, showcasing the remarkable range and power of Shabalala’s ensemble, the lyrics, alternating between Zulu and English, have no discernible narrative structure, consisting mainly of phrases rather than complete sentences. The theme, as we shall see, is African. Simon has said that “[we] wrote in English and Zulu, starting the piece in the middle and working outwards to the beginning and end”. The crux of the song, therefore, is the verse beginning “Strong wind destroy our home, many dead tonight it could be you”. This song is not about homelessness as a social problem affecting affluent western societies (not least London, where the song was recorded at Abbey Road Studios). This is the homelessness of massacre victims in a society where political violence rages. The haunting power of the key repeated chorus “We are homeless... moonlight sleeping on a midnight lake” works not just literally but as a metaphor for the political dispossession of the black South African majority. The song ends with a verse in Zulu which translates as: “We would like to announce to the entire nation that we are the best at singing in this style”. What, in another context, might simply be an amusing piece of a performer’s egotism becomes a statement of defiance. We do not accept, Ladysmith Black Mambazo proclaim, the sub-human status to which our oppressors wish to condemn us. We do not merely deserve better – we are better. The chorus lines (“I don’t want no part ...”), repeated with subtle rhythmic variation after each of the song’s three verses, shows Simon rejecting the “craziness” of a life “on fire ... all over the evening news” and telling his ex that this time “the joke is on her”. Initially recorded in Johannesburg’s Ovation Studios, the song was completed at The Hit Factory in New York. Morris Goldberg, the penny whistler on ‘You Can Call Me Al’, makes another appearance, this time on soprano sax. As if to make the point that this is a Paul Simon album, not a World Music curiosity, Graceland ends with two songs rooted in specifically American musical traditions. The first of these was recorded in Louisiana with backing from those doyens of the Cajun scene Good Rockin’ Dopsie & The Twisters. Opening with the robust accordion of the great Dopsie himself (Alton Rubin Sr.), and thus linking the song to the Gumboots accordion-based style which originally inspired the album, ‘That Was Your Mother’ is a jolly romp, sung by a father to his (implicitly grown-up) son, recalling the circumstances in which the son’s parents met. The singer reminds his son (whom he loves, despite his being “the burden of my generation” – a pun Simon uses to great poetic effect) that, though he might now be a parental authority figure, he was once a young man “standing on the corner of Lafayette” looking for some action. It is an observation few children relish hearing or are capable of fully understanding. It is a mark of Simon’s maturity that he can use this subject, and in a song of such danceable brio. (Irony is added by the presence in The Twisters’ line-up of two of Dopsie’s own sons.) It is also remarkable that, in such a seemingly simple song, he simultaneously takes the “child’s” position vis a vis a musical “parent” and pays homage to Clifton Chenier, founding father of Cajun music and “the King of the Bayou”. The final song is perhaps the bleakest on the album. The second “American” track, this time backed by the Tex-Mex stars Los Lobos, it also features the accordion – David Hildago establishing a rocking tempo which, with the long and beautiful “oo oo oo” vocal melody, belies the unvarnished grimness of the song’s lyrical content. If the chorus is melancholy (the sun getting first “weary” and then “bloody” before setting, the lack of any answer to the question “what’s a better thing to do?” in “the black pit town”, and the universality of this condition “all around the world”), then the verses positively drip with ennui. The first verse, in the voice of the cynical, faded “former talk-show host”, defines “the myth of fingerprints” – far from being unique, as criminologists affirm, “I’ve seen them all and man, they’re all the same”. The second verse uses the image of an army post – that it is abandoned only adds to the world-weary tone – as a classic example of the crushing of individuality, in this case of the army’s new recruits. The third verse largely repeats the first but, with no need to repeat his definition of the myth, Simon ends with a bleak conclusion – “that’s why we must learn to live alone”. I’ve always been a Paul Simon fan, at least since I heard ‘America’ and went backwards to the albums before Bookends. I interviewed Paul at length in New York when his There Goes Rhymin’ Simon album came out, and half way through the interview excused myself to use the bathroom in his manager’s offices where the interview took place. I thought I’d turned my tape recorder off but maybe I left it running. Either way when I got home and played back the tape there was a message from Paul telling me I ought to stop smoking – I guess I must have lit up in his presence but he was too polite to say anything. I used to bump into him sometimes at the Academy of Music on 14th Street where he’d slip in to watch a band incognito, wearing one of those parkas with the fluffy hood that he’s photographed in on his first solo album. If he saw me he’d put his finger to his mouth to indicate ‘Shhhh’. He didn’t mind a quick chat but didn’t want to be identified to all and sundry. In 1997 I wrote a small book called The Complete Guide to the Music of Paul Simon and Simon & Garfunkel. It was one in a series of CD-shaped books that Omnibus published during the nineties, about 45 in all, and also included the one with a similar title that I did on The Who. Here’s what I wrote about Simon’s pre-S&G era. Tomorrow I'll post what I wrote about Graceland. The common perception that Simon & Garfunkel emerged from nowhere as overnight successes to enjoy a number one hit with their first ever single belies the lengthy musical apprenticeship that Simon, at least, underwent before Billboard magazine showed 'The Sound Of Silence' at the top of its Hot 100 in December of 1965. 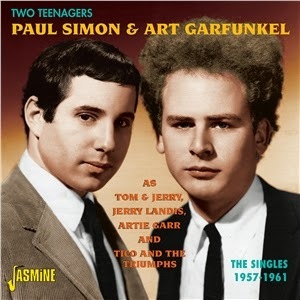 In the beginning, as Tom & Jerry, Paul Simon and Art Garfunkel were neighbourhood friends and pop music nuts from the New York suburb of Queens, who hustled their way into making a single for the independent Big label in 1957. It was called 'Hey Schoolgirl' and it reached number 54 in the US. It is difficult now to reconcile the chorus of this song – "Hey-bop-a-loo-chi-bop" – with the man who would later write songs with the depth of 'Bridge Over Troubled Water', the imagery of 'Renee And Georgette Magritte With Their Dog After The War' or the originality of 'The Boy In The Bubble', but everybody has to start somewhere, and in a nod to their past Simon & Garfunkel included it in their set on the ‘Old Friends’ tour they undertook in 2003/4. After Tom & Jerry, Simon continued to hang around New York's pop Mecca, the Brill Building, where his offices are now situated, and made records for various small independent labels (Big, Warwick, Madison, Amy) under the pseudonym Jerry Landis and with a studio band who called themselves Tico & The Triumphs. He also used the name True Taylor on a rockabilly single which sounds remarkably unlike Paul Simon. Again, none of these recordings are currently available, though with a little diligence they can be found on bootleg by anyone who is sufficiently interested to seek them out. Many of these recordings are very similar in structure, based around either the classic doo-wop style made famous by Frankie Lymon & The Teenagers and Dion & The Belmonts, or the common I-VI-IV-V (in the key of C, the chords C, Am, F and G) ballad progression utilised, for example, in Marty Wilde's well known UK pop hit 'Donna' or, in a slight vaiiation, The Beatles' 'This Boy'. The influence of The Everly Brothers, Dion, Buddy Holly and, occasionally, Elvis Presley, is easy to spot. All of them are typical of their era, the late Fifties, when pop was taking over from rock’n’roll and sharp entrepreneurs were using pop music to play on the tender emotions of impressionable teenage girls. It's likely that many of the ballads were written in the hope that they might be recorded by the bland teen idols of the day, singers like Frankie Avalon, Fabian and Bobby Vee. Although much of this early material might seem very trivial by the standards of Paul Simon's later work, it would be a mistake to dismiss it too lightly. This was Simon's musical kindergarten, his equivalent of The Beatles in Hamburg, and as he hung around the small studios, record company offices and the Brill Building, as he listened to everything that was going on around him, he learned his trade, the lessons that would stand him in good stead for years to come. He learned how songs are constructed, what is commercial, what is trite and what is acceptable. He also learned about how the music business worked and how to survive and prosper within it, which probably explains why – unlike so many of his contemporaries – Paul Simon has never been involved in ugly litigation over copyright ownership through having signed unpropitious contracts early in his career. Unlikely as it may now seem, these songs and the circumstances in which they were recorded, were the foundations on which Paul Simon built his career, and since that career has now lasted almost 50 years and shows no sign of flagging, it is safe to say that these were very valuable lessons indeed. Hey Schoolgirl (T&J): A doo-wop workout with snappy chord changes similar to The Every Brothers' 'Wake Up Little Susie'. Dancing Wild (T&J): B-side of the above, and very similar in style. TRUE OR FALSE (TT): Rockabilly effort, drawled in a Deep South accent. TEENAGE FOOL (TT): An echo-laden rockabilly ballad not unlike the slower recordings made by Elvis during his Sun sessions. Our SonG (T&J): Everly Brothers rockabilly style work-out with a neat guitar solo, all about their favourite song on the jukebox. TWO TEENAGERS (T&J): Dreadfully camp moon-in-June doo-wop number featuring high-pitched girl chorus chirping "So in love" after the title. (PRETTY BABY) DON'T SAY GOODBYE (T&J): Naïve sentimental song rhyming 'cry' with 'goodbye' on the choruses, with Everly Brothers style harmonies. THAT'S MY STORY (T&G): Primarily Art wallowing in a I-VI-IV-V style doo-wop ballad. BABY TALK (T&G): Classic doo-wop rock written song by Jan and Dean, recorded in the style of Johnny Cymbal's 'Mr Bass Man'. Great fun. ANNA BELLE (JL): A hot rock'n'roll number sung by Paul in the style of Buddy Holly. SWANEE (JL): Cover of well known minstrel/Al Jolson hit by Caesar-Gershwin, c. 1920. TOOT TOOT TOOTSIE GOODBYE (JL): B-side of above; Al Jolson cover, composed by Gus Kahn, original c. 1922. I'D LIKE TO BE THE LIPSTICK ON YOUR LIPS (JL): Teen ballad but don't blame Paul Simon for the title – he didn't write it. JUST A BOY (JL): Limp teen ballad. PLAY ME A SAD SONG (JL): Soul crooning pop. IT MEANS A LOT TO THEM JL): Generation gap teen ballad. ASK ME WHY (JL): Undistinguished romantic I-VI-IV-V style ballad. I'M LONELY (JL): Shades of future alienation songs on this moody ballad. I WISH I WEREN'T IN LOVE (JL): Nightmarishly bad lyrics on a sentimental doo-wop ballad bemoaning the horrors of unrequited love. MOTORCYLE (T&TT): Stunningly original rock'n'roll tribute to two wheeled hot rods, punctuated by the sounds of engines roaring and the kind of doo-wop harmonies that enhanced The Beach Boys' best car songs. Tico rasps the lyrics. I DON'T BELIEVE THEM (T&TT): Slow I-VI-IV-V style ballad. WILDFLOWER (T&TT): Bo Diddley beat style rocker whose Spanish lyrics give it a Mexican slant. EXPRESS TRAIN (T&TT): Train sounds introduce a Dion & The Belmonts style rocker with 'clickety-clickety' lyrics. GET UP AND DO THE WOBBLE (T&TT): Typical dance track of the era; Simon's take on Little Eva's smash hit 'The Locomotion'. CRY LITTLE BOY CRY (T&TT): Dull slab of melancholia with Dion style slow start. THE LONE TEEN RANGER (JL): Hilarious novelty send-up of The Lone Ranger TV show in which Jerry bemoans the loss of his girl to the masked Teen Ranger! Complete with pistol shots, 'Hi-Ho Silver' lyrics and Rossini's William Tell overture! Probably inspired by The Olympics' 1958 hit 'Western Movies'. LISA (JL): Soft I-VI-IV-V style ballad in which Jerry sends a 'Dear John' letter to the unfortunate Lisa because he's not yet ready to settle down. NOISE (T&TT): A rocking doo-wop effort about a party where the guests made lots of noise! CARDS OF LOVE (T&TT): Shang-a-lang doo-wop song with lyrics based on the pack of cards – "You were my Queen, I was your King, then Jack stole you". Ouch! Fighting Mad (T&J): Everly Brothers style rocker. SURRENDER PLEASE SURRENDER (T&J): The Everly Brothers meet Buddy Holly on this ballad, with changes not unlike Holly's 'Everyday'. LOOKING AT YOU (T&J): A fast tempo rock'n'roller. I'M LONESOME (T&J): Typically slowish I-VI-IV-V style ballad of which hundreds were recorded between 1958 and 1962.